A recent report by the National Bank for Agriculture and Rural Development (NABARD) enlightens one about the state of farmers' income and indebtedness in 2015-16. Entitled NABARD All India Rural Financial Inclusion Survey 2016-17 – in short NAFIS 2016-17 – the report says that between 2012-13 and 2015-16 the average monthly income for agricultural households grew by around 39 percent. One may recall that the Key Indicators of Situation Assessment Survey of Agricultural Households in India report of the National Sample Survey Office (NSSO) had found that the average monthly income per farm household at the national level during the crop year July 2012-June 2013 was Rs. 6,426/-. The NAFIS 2016-17 report says that the average monthly income per agricultural household at the national level reached Rs. 8,931/- in the crop year 2015-16. It may be noted that the Consumer Price Index (Rural) (base year 2012 = 100) during July 2012 – June 2013 was 104.96 and during July 2015 – June 2016 was 128.08, which clearly points to an increase by 22.03 percent between the two periods. When adjusted to the inflation in CPI (Rural), the net increase in monthly income per agricultural household in real sense comes out to be approximately 17 percent between 2012-13 and 2015-16. Thus, one may say that the monthly income per farm household (after adjusting to inflation) grew annually by 5.7 percent during the three years between 2012-13 and 2015-16. It will take roughly 17.5 years for a farmer's monthly income [in real terms viz. after adjusting to inflation in CPI-(Rural)] to double since 2012-13 if its annual growth continues at 5.7 percent. However, it may be noted by the readers that the Prime Minister has set up the goal to double the income of the farmers by 2022. The average monthly consumption expenditure per farm household was Rs. 6,223/- in 2012-13 according to the NSSO's 70th round report, whereas the same stood at Rs. 7,152/- in 2015-16 as per the NAFIS 2016-17. Thus, one may notice that the net monthly income (viz. the difference between monthly income and monthly consumption expenditure) per agricultural household in nominal terms has grown by almost 776.35 percent from Rs. 203/- to Rs. 1,779/- between 2012-13 and 2015-16. When adjusted to the rise in CPI (Rural), it could be observed that the net monthly income per agricultural household in real terms has escalated by almost 754.3 percent between 2012-13 and 2015-16. The NAFIS 2016-17 report shows that as compared to the monthly income of an agricultural household (viz. Rs. 8,931/-), the average monthly income of a non-agricultural household (viz. Rs. 7,269/-) is lower. Likewise, as compared to the monthly consumption expenditure of a farm household (viz. Rs. 7,152/-), the average monthly consumption expenditure of a non-farm household (viz. Rs. 6,187/-) is smaller. The net monthly income per non-agricultural household in nominal terms stood at Rs. 1,082/- in 2015-16. The Key Indicators of Situation Assessment Survey of Agricultural Households in India report reveals that the top 5 states in terms of average monthly income per agricultural household in 2012-13 are Punjab (Rs. 18,059/-), Haryana (Rs. 14,434/-), Jammu and Kashmir (Rs. 12,683/-), Kerala (Rs. 11,888/-) and Meghalaya (Rs. 11,792/-). Kindly consult chart-1 for details. Similarly, the NAFIS 2016-17 report shows that the top 5 states in terms of average monthly income per farm household in 2015-16 are Punjab (Rs. 23,133/-), Haryana (Rs. 18,496/-), Kerala (Rs. 16,927/-), Gujarat (Rs. 11,899/-) and Himachal Pradesh (Rs. 11,828/-). Please see chart-1. The top five states that exhibited the highest jump in average monthly income per agricultural household between 2012-13 and 2015-16 are Uttarakhand (130.9 percent), Bihar (101.7 percent), West Bengal (94.9 percent), Chhattisgarh (65.7 percent) and Odisha (55.4 percent). It may have occurred due to low base effect. The NAFIS 2016-17 report, however, says that "the estimates are based on reported data by the respondents and not strictly comparable with other survey estimates available due to differences in concepts and definitions as also due to specific sampling design adopted and the estimation procedure followed". 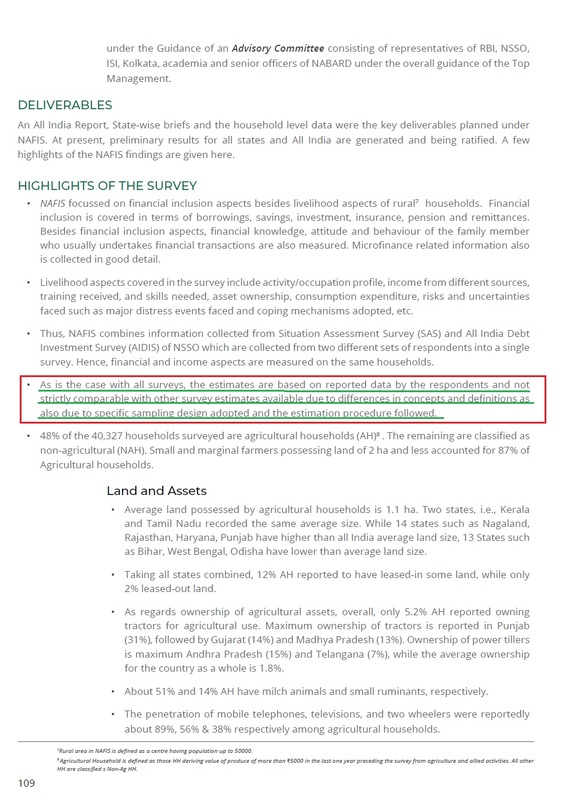 Therefore, strictly speaking, the data provided by the Key Indicators of Situation Assessment Survey of Agricultural Households in India report and NAFIS 2016-17 report are incomparable. Experts have questioned why 2015-16 – a drought year – was selected as the reference period for the NAFIS 2016-17 report. The NSSO 70th round had found that nearly 52 percent of the country's agricultural households were indebted at the time the survey was carried out. The average amount of outstanding loan per agricultural household as on the date of the survey was Rs. 47,000/-. The NAFIS 2016-17 report says that 52.5 percent agricultural households and 42.8 percent non-agricultural households were reportedly indebted at the time of survey. The average amount of outstanding loan per indebted agricultural households was Rs. 1,04,602 as on the date of survey. In other words, between 2013 and 2016-17, the average amount of outstanding debt has more than doubled. It may be noted that based on a nationwide consultative process involving more than 190 farmers’ organisations, a bill entitled The Farmers' Freedom from Indebtedness Bill (2018) was formulated this year. Among other things, the bill, which was prepared by the All India Kisan Sangharsh Coordination Committee (AIKSCC), proposes a one-time immediate and complete loan waiver. The NAFIS 2016-17 report reveals that the average amount of outstanding loan per agricultural household (viz. Rs. 1,04,602/-) was higher than that of non-agricultural household (viz. Rs. 76,731/-). According to experts, raising the threshold level of annual agricultural income from Rs. 3,000/- to Rs. 5,000/- is likely to produce an upward bias in the average income of agricultural households as estimated by the NAFIS 2016-17. According to the NAFIS 2016-17, an agricultural household is defined as one that received some value of produce above Rs. 5,000/- from agricultural activities (e.g., cultivation of field crops, horticultural crops, fodder crops, plantation, animal husbandry, poultry, fishery, piggery, bee-keeping, vermiculture, sericulture, etc.) and having at least one member self-employed in agriculture either in the principal status or in subsidiary status during last 365 days. The condition of land possession was dispensed with in the report. On top of that, in order to eliminate households pursuing agricultural activities of insignificant nature, households that reported a total produce of more than Rs. 5,000/- during last one year were only considered as agricultural households in the NAFIS 2016-17. For the purpose of Situation Assessment Survey (SAS) of NSS 70th round, an agricultural household was defined as one receiving some value of produce from agriculture activities (e.g. cultivation of field crops, horticultural crops, fodder crops, plantation, animal husbandry, poultry, fishery, piggery, bee-keeping, vermiculture, sericulture, etc.,) during last 365 days. However, household which were entirely agricultural labour household were excluded from the coverage. In contrast to the definition of farmer used in the 59th round of NSS, the necessary condition of 'land possession' had been dispensed with in the 70th round. Apart from agricultural labourers, households receiving income entirely from coastal fishing, activity of rural artisans and agricultural services were not considered as agricultural household and they were kept out of the scope of the survey. Further, in order to eliminate households pursuing agricultural activities of insignificant nature, households with at least one member self-employed in agriculture either in the principal status or in subsidiary status and having total value of produce more than Rs. 3,000/- during the last 365 days were only considered for being selected for the SAS survey. It may be noted by the readers that for most questions present in the questionnaire for NAFIS 2016-17, the reference period was taken as one year (365 days) preceding the date of survey. For agriculture related details the reference period is the agriculture year 2015-16, i.e., 1st July 2015 to 30th June, 2016. The reference period differed for some specific sections, for example to obtain reliable consumer expenditure data, a mixed reference method was used where the reference period was taken as last one year for certain non-food items of infrequent consumption and as last one month for all other consumption items, while for certain general items, the reference period was taken as last one year, preceding the date of survey. Similarly, the reference periods for obtaining responses regarding household income, savings, investments, etc. was taken as last one year from the date of survey. The NAFIS, which was launched in 2016-17 as a national level survey, covered a total of 40,327 households across 2016 villages/ wards spread over 245 districts from 29 states. These households together accounted for a population of 1,87,518 persons in total. 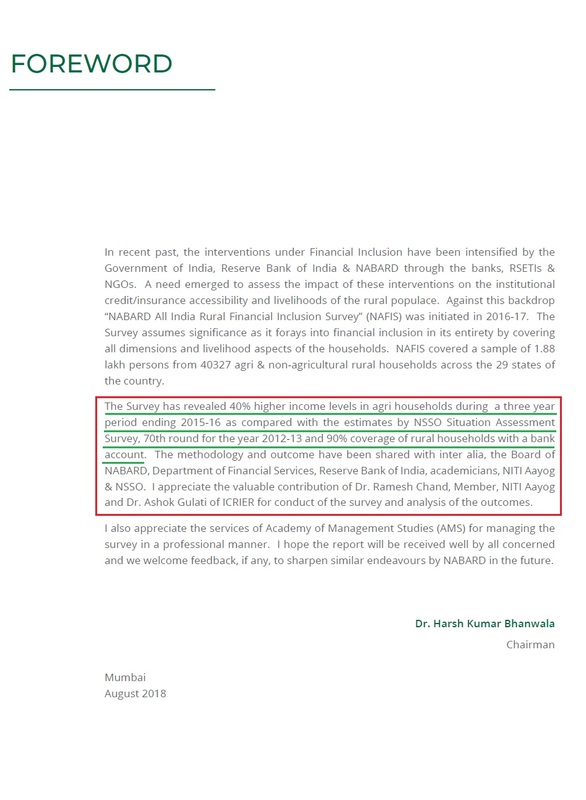 For the purpose of NAFIS 2016-17, a broader definition of 'rural' is used as the survey sample is drawn from revenue villages, as well as Census Enumeration Blocks from other centres having a population of less than 50,000, which is a sub-set of the usual 'semi-urban' area that includes centres of up to 1,00,000 population. The Situation Assessment Survey, on the other hand, was conducted during the NSSO’s 70th round (January – December, 2013) so as to collect information on various aspects of farming, such as farming practices and preferences, availability of resources, awareness of technological developments and access to modern technology in the field of agriculture and level of living measured in terms of consumer expenditure, income and indebtedness from the agricultural households in rural India. The NSSO survey, with its two visits, made a comprehensive assessment of the situation of the agricultural households for the crop year July, 2012 – June, 2013. • Average monthly income for agricultural households is Rs. 8,931; 35 percent of which is received from cultivation, followed by wages (34 percent), salaries (16 percent), livestock (8 percent) and non-farm sector (6 percent). Other sources, including income from rent on building or land, income from interest earned on bank deposits, dividend or interest earned from investments accounted for 1 percent share of total income. Transfer income (which includes remittances) received by the households have not been accounted for, while calculating the total income. • Non-agricultural households reported average monthly income of Rs. 7,269 per month, of which, 54 percent is from wages, 32 percent from salaries, followed by non-farm sector activities accounting for 12 percent of total income. • Taking all households combined, the average monthly income stood at Rs. 8,059. 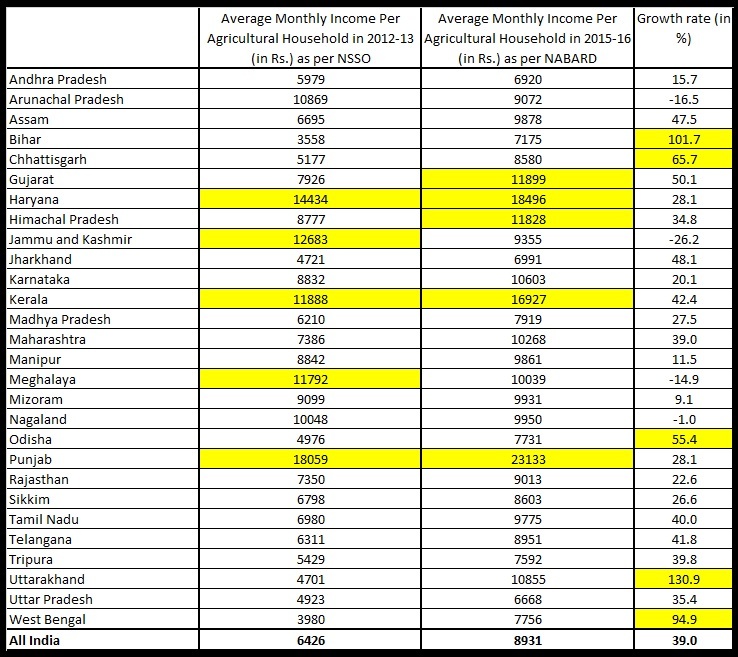 20 states are having higher average monthly income as compared to all India estimates. • The average monthly per household consumption expenditure (MHCE) for all households was Rs. 6,646 which is less than average monthly income of Rs. 8,059. The MHCE for agricultural households is higher (Rs. 7,152) as compared to that of non-agricultural households (Rs. 6,187). Also, MHCE for AH and NAH is lower than their monthly income. • 51 percent of the total consumption expense is reported to have been made on food items and remaining 49 percent on the non-food items. • Livelihood shocks faced by households at least once over the last 10 years include crop failure due to natural calamities (reported by 54 percent AH), yield loss due to pests and insect’s infestation (reported by 28 percent AH), and sudden fall in crop prices (reported by 18 percent AH). Taking all households combined major illness/ accidents (by 19.7 percent all HH) was another major shock faced in the given reference period. • Average land possessed by agricultural households is 1.1 hectare (ha). Two states, i.e., Kerala and Tamil Nadu recorded the same average size. While 14 states such as Nagaland, Rajasthan, Haryana, Punjab have higher than all India average land size, 13 States such as Bihar, West Bengal, Odisha have lower than average land size. • Taking all states combined, 12 percent AH reported to have leased-in some land, while only 2 percent leased-out land. • As regards ownership of agricultural assets, overall, only 5.2 percent AH reported owning tractors for agricultural use. Maximum ownership of tractors is reported in Punjab (31 percent), followed by Gujarat (14 percent) and Madhya Pradesh (13 percent). Ownership of power tillers is maximum Andhra Pradesh (15 percent) and Telangana (7 percent), while the average ownership for the country as a whole is 1.8 percent. • About 51 percent and 14 percent AH have milch animals and small ruminants, respectively. • The penetration of mobile telephones, televisions, and two wheelers were reportedly about 89 percent, 56 percent & 38 percent respectively among agricultural households. • 88.1 percent of the HH reported having a bank account. • 55 percent of Agricultural households reported any savings during the last year and of these 53 percent saved with institutions like banks, post offices and SHGs. Average savings per annum per saver households was reportedly Rs. 17,488, of which 95 percent is with institutional agencies. • Savings amount per saver AH reportedly ranged from Rs. 12,941 for lower marginal farmers (0.01 to 0.40 ha land possessed) to Rs. 31,831 for saver AH with more than 2 ha of land. • 50.6 percent of all households and 46.3 percent of Non-Agricultural households reported savings during last year. They have preferred institutional agencies as they parked 94 per cent of their savings with institutions (including SHGs). Average savings per all households who reported saving was Rs. 18,007 and that for saver non-agricultural household was Rs. 18,568. • Considering all households together, the proportion reporting any saving by at least one member increased with increase in MPCE, with 47 percent households reporting any saving in decile class 1 to 60.5 percent households reporting the same for decile class 10. • 34 percent of all households who saved in the given year, reported savings by 2 or more members per family. • 10 percent of AH reported any investment in the last one year. Taking all investments made by the households in the given year, the average investment per investing AH was reportedly Rs. 62,734. For all investments amounting more than Rs. 10,000 in the year, 60 percent of the amount was funded through borrowings from either institutional or informal sources. • The proportion of all households reporting investments during the last year increased with increasing MPCE classes from 2.8 percent for decile class 1 to around 28 percent for decile class 10. • Incidence of Indebtedness (IOI), measured as proportion of HH reporting outstanding debt on the date of the survey. 52.5 percent AH and 42.8 percent NAH were reportedly indebted at the time of survey. All India IOI taking all rural households together stands at 47.4 percent. • IOI increased with increase in MPCE Decile Class and with increase in size class of land possessed. It increased from 39.5 percent at the lowest decile to 68 percent in the 10th decile among agricultural households. For the same AH, the IOI ranged from 48 to 49 percent for landless and lower marginal farmers, to 60 percent for above 2 ha category. • IOI was reportedly lowest in Jammu (26.7 percent) and highest in Telangana (79.5 percent). • Average amount of outstanding debt (AOD) for indebted agricultural households is reportedly Rs. 1,04,602 as on the date of the survey. Debt outstanding for indebted non-agricultural households is reportedly Rs. 76, 731. Overall extent of indebtedness taking all households combined is Rs. 91,407. • Taking combined estimate for all households, the average amount of outstanding debt per indebted household increased with increase in MPCE decile classes. The value of AOD per household for MPCE decile 10 was Rs. 1,62,466 which was more than double the amount for MPCE Class 1 (Rs. 81,839). • 43.5 percent AH reported to have borrowed any money during last year from some source or the other. 60.4 percent of them reportedly borrowed from institutional sources exclusively. Further, 30.3 percent borrowed from only informal sources and 9.2 percent of agricultural HH borrowed from both sources. 56.7 percent of non-agricultural households and 58.6 percent of all HH borrowed from institutional sources during last year. • During the reference year, a borrowing agricultural HH reportedly availed a loan of Rs. 107,083 from various agencies, 72 percent of which was availed from institutional sources including MFIs and SHGs. 69 percent of borrowings of all HH and 65 percent of non-agricultural households were from institutional sources. • Considering all loans taken by agricultural households, it was found that a majority of 44 percent loans were taken for agriculture purposes, followed by domestic needs (19 percent) and medical expenses (12 percent). Of the remaining, 16 percent loans were taken for non-agricultural purposes, 11 percent for housing and 4 percent for other purposes. • Among AH owning more than 0.4 ha land and borrowing from institutional agencies 32 percent have reportedly been issued KCC. • 24 percent of AH have reportedly one or more members associated with one or the other type of Microfinance groups such as Self-Help Groups, Joint Liability groups or other communities. 22 percent AH reported membership in SHGs. • Of the MF services, 62.5 percent agricultural households reportedly availed personal loans, 26 percent availed loans for promoting any enterprise, and 19 percent received any kind of training support from MFIs. • About 26 percent agricultural households and 25 percent of non-agricultural households reported to have been covered under one or the other type of insurance. • Among AH who reported to have taken any loan for agricultural purposes in the last one year from institutional agencies, 6.9 percent reported being covered under crop insurance. • Livestock insurance penetration is reportedly 1.7 percent amongst AH owning milch animals. • The coverage under any type of insurance was reported to be about 18.9 percent for NAH as against 20.1 percent for AH. • When assessed for type of pension received, 32 percent of all households with senior citizens reported being covered by old-age pension. • Overall, only 9.4 percent individuals from rural areas and over 13.2 percent from semi-urban areas reported to have been exposed to any session on financial education or training. • On the whole 40 percent respondents fared well on financial knowledge scale giving all correct responses to the questions asked. Assessment according to location revealed that 48 percent respondents from rural areas and 52 percent from semi-urban areas were assessed to be having sound financial knowledge. • When assessed for financial attitude, 42 percent individuals from rural areas and 48 percent from semi-urban areas were found having positive attitude, earning a score of 3 or more on a scale of 5. • Behavioural assessment reflected that 57 percent individuals from rural areas and 54 percent from semi-urban areas exhibited good financial behaviour, earning a score of 6 or more on a scale of 5. • As per the combined estimation on financial literacy status, for individuals who fared well in all three above components, 11 percent of rural respondents and about 15 percent semi-urban area respondents were found to be have good financial literacy. • 48 percent respondents reported that they needed some loan in the last one year. Among these, 29 percent sought loan from institutional sources and got it too. 14 percent sought it from informal sources and got it, while out of remaining 2 percent sought it but did not get it and 3 percent did not seek it despite needing it. • As regards usage of various financial services within a period of last 3 months, about 24 percent reported to have used ATM services, with 73 percent of the users being absolutely comfortable and confident of being able to use it independently. • About 7.5 percent individuals reported to have used cheque or debit/ credit cards for making any payment in the last 3 months and more than 95 percent of users found these mechanisms easy to use.